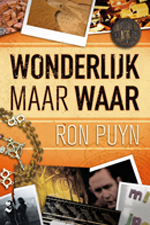 Wonderlijk maar Waar, written by me using my real name Ron Puyn, is a non-fiction mammoth collection of stories that are strange, wondrous, miraculous or downright bizarre, but always true and riveting. It’s available in print (€ 19,95) and as an E-book for just € 4,95. Dutch language only. Order now in our shop. If you prefer a print copy, you can choose to have your copy signed by the author.